What are the pros and cons of reverse osmosis filtration? Which RO system is the best? Osmosis is the natural diffusion of water across a semi-permeable membrane from an area of low salt concentration to an area of high salt concentration. Reverse osmosis (as the name implies) reverses this process, using pressure to force water across a semi-permeable membrane in order to remove salts and other dissolved solids. This process has been applied to drinking water filtration, using household water pressure to remove impurities from tap water (See Fig. 1). All RO systems have the same basic components. Water flows through a valve that attaches to the cold water supply line into a tube that attaches to the RO pre-filter. There may be one ore more pre-filters, depending on the type of RO membrane used in the system. The most commonly used pre-filter removes dirt and sediment from the water. A carbon pre-filter may also be used to remove chlorine. 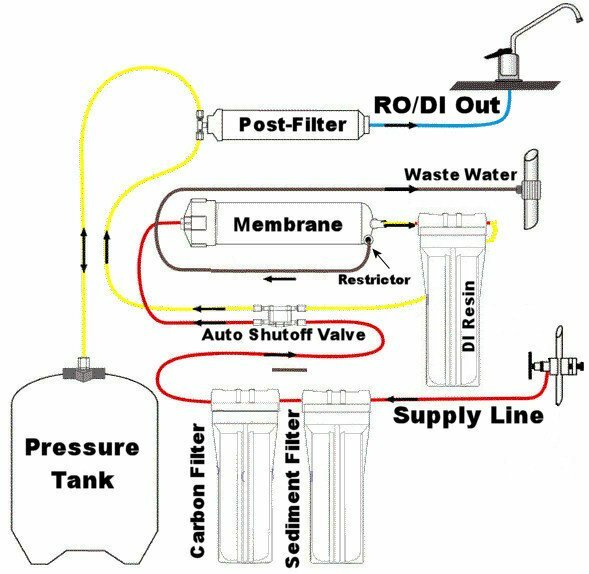 Pre-filters prevent membrane fouling, extending the life of the reverse osmosis membrane. Water flows from the pre-filter(s) through the RO membrane which removes the majority of dissolved impurities. This is the most important component of any reverse osmosis filtration system. The purified water then flows into a storage tank. Once the storage tank is full, a shut-off valve prevents more water from passing through the membrane, temporarily halting water production. The RO unit comes with it's own faucet, which is usually installed on the kitchen sink, apart from the regular faucet. When the RO faucet is turned on, purified water flows from the storage tank, through a post-filter which removes any remaining tastes and odors from the water, which is then ready to drink. A drain line runs from the outlet end of the RO membrane housing to the drain; this line disposes of the impurities and contaminants removed from the incoming water source (See Fig. 2). Reverse osmosis will effectively reduce most microorganisms, inorganic chemicals and contaminants including: arsenic, chlorine, fluoride, heavy metals, nitrates, sediment, iron, bacteria, viruses, cysts, bad tastes and odors. Reverse osmosis has a very high rejection rate for most impurities found in drinking water and is very cost-effective in the long term. This type of filtration is effective at producing pathogen-free and mineral-free water, and is especially good for use in areas with well-water or water that is not municipally treated. However, RO filtration is not without its disdavantages. Since an RO membrane still allows the passage of harmful chemicals like chlorine, pesticides and herbicides, pre-filtration is needed as a supplement. Municipally treated water often contains such contaminants. RO filters also strip water of minerals that may be (arguably) beneficial to the body and which give water a more refreshing taste. Another disadvantage of RO filtration is the large amount of wastewater produced. For each gallon of water purified, at least three gallons of water is wasted. Moreover, compared to other filtration methods, reverse osmosis is a very slow process. 4-stage system with 4-gallon storage tank; available with flow rates of 9, 25, 50 or 75 gallons per day. 4 stage systems with 4-gallon storage tank; available with flow rates of 50 or 75 gallons per day; also available with booster pump to keep water pressure at optimal level formaximum production and rejection of total dissolved solids. 3-stage system; 1.9-3.2-gallon storage tank capacity; features an electronic monitor that tells you when to change your cartridges. 3-stage system with a 2.4-gallon storage tank; flow rate of 12 to 18 gallons per day. 4-stage system with 9-inch wide storage tank for more space under the sink; unique design makes changing the filter cartridges virtually effortless. 3-stage system with 3-gallon storage tank; requires that filters are changed every 3-6 months and the membrane every 1-2 years.